In these early days of electric vehicles, one of the major points holding people back from making the switch is the lack of available charging stations. What if you’re miles away from home with a low battery and no place to charge in sight? 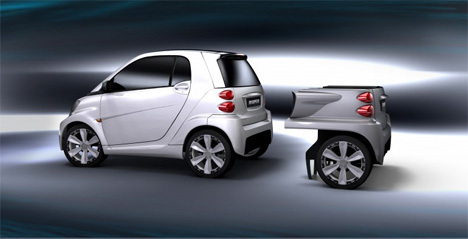 The Dock + Go concept from Rinspeed is a pretty clever attachment for the back end of your electric vehicle that would extend its range as well as adding some extra cargo space. The single-axle packs are simply attached to the back of an electric car to hold whatever you might need for work or play, along with a source of extra fuel. That could be extra batteries, a range extender or even a combustion engine. Because the modular pack is easy to mount and dismount, different packs could be used for different jobs or different functions. Pizza delivery services could load up special heater-equipped packs for their drivers so the driver has only to attach the right EV pack and go. Specialized tool kits could also be packed into each little attachment so mechanics or maintenance workers would always have the right tools for the job. 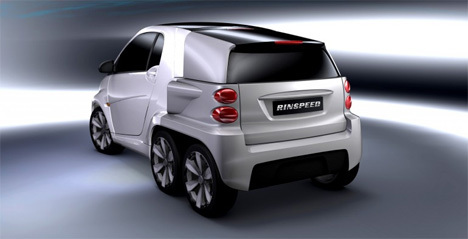 Rinspeed used a Smart ForTwo to demonstrate the EV pack, but the product could be made for any type of EV. No word yet on when they’ll be available to the public, but Rinspeed is introducing the concept at the 2012 Geneva International Motor Show. See more in Cars & Trucks or under Transportation. December, 2011.